The third and final film of the Indiana Jones trilogy (yeah, there is a fourth one, but I try not to think about that one much) is one of my favorites. Honestly, I am never sure if I prefer Raiders of the Lost Ark or this one, Indiana Jones and the Last Crusade. 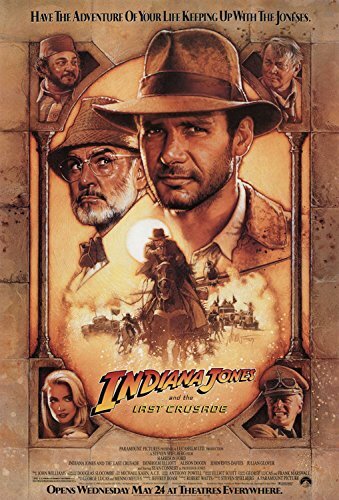 The Last Crusade went back to Indiana Jones basics as they sent Indy on a quest for the Holy Grail and they kept the mystical stuff to the ending. The film followed the pattern of the original film but this one had some extra special. Sean Connery played Dr. Henry Jones, the estranged father of Indiana Jones and the connection between Connery and Harrison Ford is magic. The film was great from the beginning with young Indiana Jones (River Phoenix) through the set-up, but the movie truly caught on fire when Indy crashed through the window and gets smashed in the head with a vase… thankfully a fake one. The constant dialogue and bickering between Henry Jones and “Junior” was just tremendous. These characters were so deeply rooted in love despite the fact that they had barely been talking that you can feel it through the screen. The scene where Indy was believed to have been killed in the tank that went over the cliff was some of the best, most subtle acting from Connery that we have ever seen. There was great action as in any Indiana Jones movie and the humor is a perfect fit and hit nearly every time.